5160 Private George Creber of the 1/6th Battalion, the Devonshire Regiment. Believed to be the son of Amos and Betsy Creber. Born in Horrabridge in 1876. Died 8 March 1916 aged 40. 160160 Sapper Frederick J. Hannaford of the 212th Field Coy.,the Corps of Royal Engineers. Son of William and Jane Hannaford. Born in Chagford in the March Quarter of 1883. 1883. 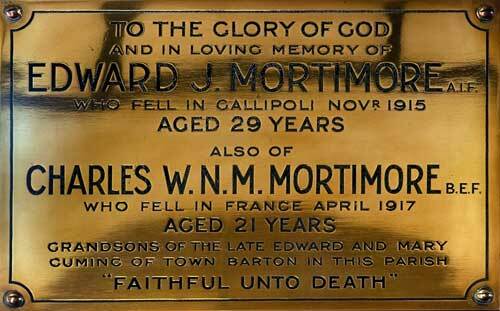 Died 5 September 1917 aged 34. 29362 Private Cyril James Harvey of the 7th Battalion, the East Yorkshire regiment. Son of James and Emmeline Harvey of Manaton. Born in Manaton28 August 1895. 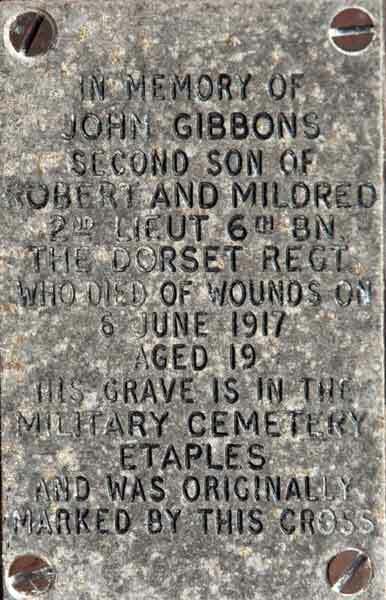 Died 31 March 1918 aged 22. Formerly M2/184652 of the Royal Army Supply Corps. Gunner Sidney Howe of the Royal Marines Artillery, the anti-aircraft Brigade. Grandson of John and Anne Howe of Manaton; grandson also of Thomas Wreford, next of kin of Heaton Manston, Moretonhampstead. Born in Manaton 28 August 1895. Died from disease 22 April 1916 aged 21. 11894 Lance Corporal George Perryman of the 8th Battalion, the Devonshire Regiment. Son of William and Miriam Perryman. Born in Gidleigh in 1891. Died 25 September 1915 aged 24. 42412 Private Alfred Wreford of the 2nd Battalion, the Suffolk Regiment. Son of James and Anna Wreford. Born in Manaton in the September Quarter of 1887. Died 1 October 1918 aged 31. 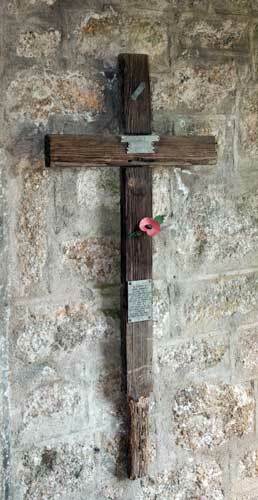 In the church porch is a most interesting link with the First World War.. Men were buried more or less where they fell and the custom was to mark the spot with a rough wooden cross. Most of these eventually rotted away and were replaced with the stone markers of the War Graves Commission but a few were brought back to England mostly by former colleagues of the dead men who handed them over to their grieving families. Screwed to this particular cross was a small metal label giving details of the dead man. 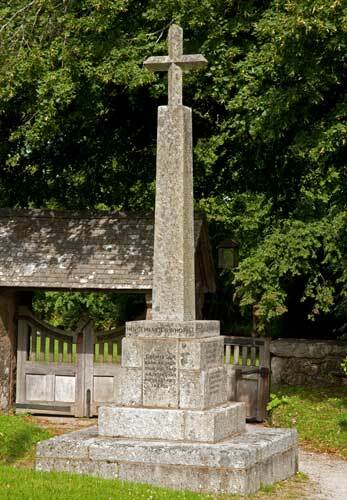 We have not been able to trace a connection with Manaton for this family so perhaps that is why he is not listed on the village War Memorial. The cross brought back from the battlefield where John Gibbons died.